McInerney to debut Justin McInerney will debut in Round 4 against the Melbourne Demons. He spoke to Swans TV in preparation. Pick the odd one out. Pat Cash, Stephen Silvagni, Alphonse Gangitano, Andy Maher, Mark Bresciano, Bob Skilton and Justin McInerney. A Wimbledon tennis champion, fullback in the AFL team of the century, a Melbourne underworld figure featured in the Underbelly TV series, a TV host and radio personality, an international soccer player, the greatest Swan of all-time, and a looming Swans debutant. Surely it must be McInerney. The rest are household names. McInerney is a young man just starting out on his life journey. Wrong! The odd one out is Skilton. All the others are products of Marcellin College, a catholic secondary school in suburban Bulleen in Melbourne. Eighteen-year-old McInerney, who will debut for the Swans against Melbourne at the SCG tonight, shares a special heritage that includes many beyond the assembled celebrities listed above. Among the AFL footballers also to come out of the school are Marcus Bontempelli, Gavin Brown, Peter Curran, Leigh Montagna, Luke Shuey, David Zaharakis, Josh Caddy, Jack Newnes, Greg Madigan, Paul Dimattina, Andrew Tranquilli, Jason Cripps and Frank Marchesani. Plus, former tennis great Peter McNamara, international DJ Anthony Pappa, actor and comedian Stephen Curry and Victorian politicians Michael O’Brien and Martin Dixon. Oddly, a Justin McInerney was school captain at Marcellin in 1982, when Maher graduated, but he is no relation to the emerging Swan. McInerny also joins a strong list of graduates of the Northern Knights to play in the AFL. Among his predecessors have been Swans draftees Anthony Rocca, Stuart Mangan, Paul Licuria, Patrick Vezzpremi, Brett Meredith and Tyrone Leonardis, plus Adam Simpson, Brent Harvey, Bontempelli, Nick Stevens, Simon Prestigiacomo, John Barker, Daniel Harford, Blake Caracella, Rhyce and Heath Shaw, Lance Whitnall, Montagna, Brett Stanton, Matthew Kreuzer, Trent Cotchin, Michael Hurley, Zaharakis, Dylan Grimes, Caddy, Nick Vlaustin, Jayden Short and Jade Gresham. McInerney will wear jumper #27 that has been the property in recent years for 25-gamer Dan Robinson. Other more prominent players in #27 have been 1950s star Eddie Lane (96), 1945 club champion Jack Graham (95) and 2005 premiership player Jason Ball (90), and more recently Wade Chapman (42) and Sanford Wheeler (41). Graham, known for his use of the place kick and twice top 10 in the Brownlow Medal, finished his career from 1944-49 in #27 after playing 132 games in #22 from 1935-43. McInerney, the Swans’ third pick in the last year’s National Draft behind #10 Nick Blakey and #25 James Rowbottom, was nicely profiled by Andrew Wu in the Age today. The story told how, when asked by coach John Longmire in a team meeting on Wednesday to tell his teammates something about him they would not know, McInerney revealed he was born with the umbilical cord around his neck and “came out blue”. It was just before Longmire told McInerney something he didn’t know – that he would debut tonight. Wu also detailed McInerney’s rapid rise to AFL ranks. Only two years ago, when in Year 11 at school, he was playing in the seconds at Marcellin. He got his big break at a junior game for his club side Bunyule in Melbourne north-east when spotted by a Northern Knights talent scout. He didn’t play seconds again. As a year 12 student McInerney clocked a sub-52 second time for 400m and finished second in a major schools championship in Melbourne. His GPS numbers for game day running and high-speed efforts were spectacular as he doubled the repeat speed efforts of West Coast Eagles flyer Jack Petruccelle, and was the only player in the program to hit real high-speed effort. He was alite. Having grown up a Carlton supporter who idolised Chris Judd, McInerney was considered something of a surprise pick in the draft last year. So much so that the AFL website did not have his photo ready in their draft portal. 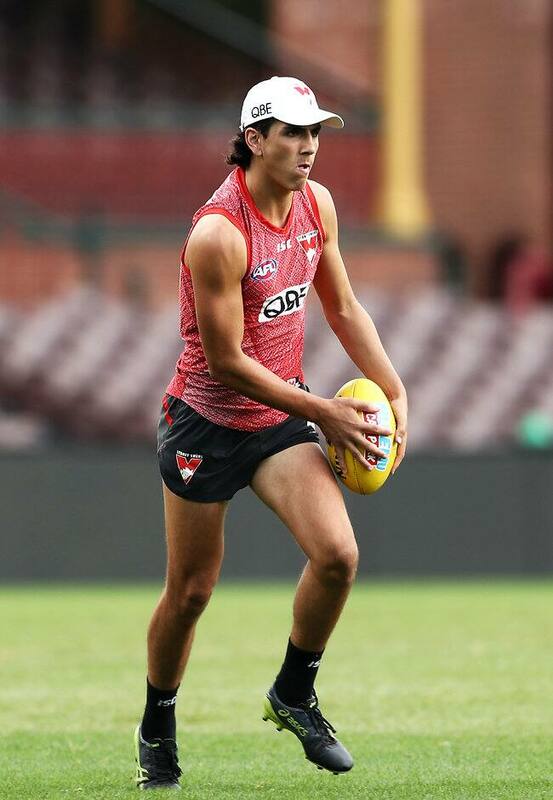 But, set to follow Blakey to become the second player born in the 21st century to play for the Swans, he has put on 5kg since he joined the club and has done everything right to jump so quickly into the AFL team. He will be the first McInerney to play for the Swans and the third Justin behind Justin Clarkson, who played three games in 1991, and Justin Crawford, who played 17 in games in Sydney from 1995-96 before 29 games at Hawthorn in 1997-98.